SO, WHAT CAN YOU EXPECT…… TO PUT IT MILDLY…..EXPECT THE BEST! Expect only the best decorative artists in the industry to be working on your project. ALL OF OUR DECORATIVE ARTISTS, TRULY LOVE WHAT THEY DO; THIS IS WHY YOU WILL TRULY LOVE WHAT THEY DO FOR YOU! 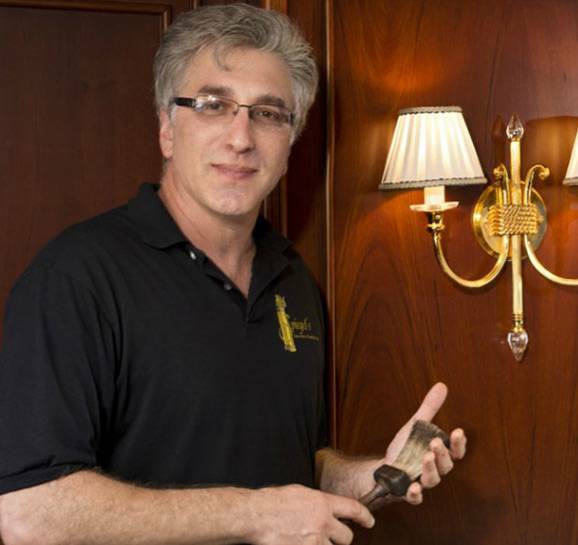 We realize that our staff is such an important part of your experience with Spiegel’s Decorative Finishes. That’s why each member of our staff is extremely passionate and meticulous about every detail of every aspect of every project! Eric Spiegel is globally recognized as one of the premier master decorative artists in the industry. His technical ability, sense of design and meticulous attention to detail is unparralled. Eric is a master color expert and brings over thirty-five years of experience to your project. Eric personally supervises all projects and performs many of the more advanced techniques and finishes. Eric has worked with some of the most prominent artists in the business. He does not settle for good work; he will only settle for outstanding work! To say Eric’s standards are high would be an understatement! Expect, to enjoy this experience. Yes, I say enjoy this experience. Our staff will cover and protect all your furniture, flooring and belongings. We will leave the job as clean, or possibly cleaner than when we arrived! Our staff shows up on time, are well groomed and are extremely professional. Expect, to have your walls, ceiling and furniture look better than you ever could have imagined. We pride ourselves on staying current with all the new design trends, materials and finishes. Whether your style is contemporary, transitional, traditional or eclectic, we have you covered! Eric’s ability to be innovative and creative, along with a masterful sense of color and design, are the reasons our work is featured in the top books & magazines in the business, over the years. I promise you, this will be one “Experience” you won’t regret! You’re probably wondering, how do I get started? Go to the contact section and send me a note about your project, your contact information, and a brief description of your project’s needs. You can also call our office at 239 500-FAUX (3289). If no one is available at that moment, leave a brief message. We will get back to you within 24 hours. I can also be reached on my cell phone at 239 273-1100. I try to make myself very available to our clients. Please, give me some available times that would work for you to schedule our meeting. If you are computer savvy, shoot me a few pictures of the areas; my brain works even when I am sleeping, creating designs and finishes for your upcoming projects. Typically, we will arrange a meeting at the project site. Here, we will discuss all the many possibilities we can provide for you. If I have an idea, prior to our meeting, regarding the scope of the project, I will usually bring sample boards I think may interest you. After our meeting, I will send you a proposal within a few days. Once you agree to the terms and we receive a deposit, we will place your job on the schedule and start creating your customized sample boards for your approval. Feel free to call me regarding any questions you might have or just to say hello. Thanks for taking the time to enquire about Spiegel’s Decorative Finishes. It is my extreme pleasure to write this recommendation for Spiegel’s Decorative Finishes. As the Manager of the Brighton Condominium for the past thirteen years I have seen a lot of Eric’s work here in the common area of the condominium as well as in many of the units where owners have contracted with him for the application of finer finishes in their apartments. His work is nothing short of spectacular. He has the artistic eye and mind to transform any surface into anyone’s dream. I would highly recommend Eric for any project small or large. One word.....OUTSTANDING! 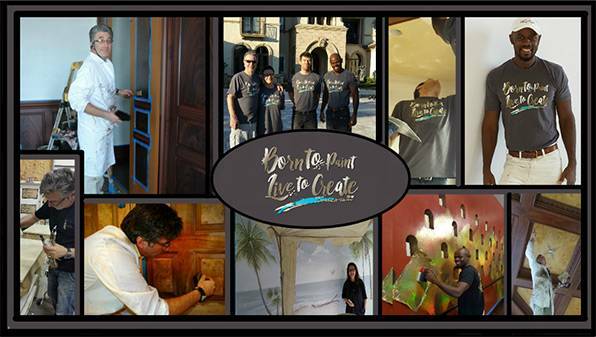 We hired Eric for many projects including refinishing furniture, specialized painting and Venetian plaster. All of these areas were met with the highest regard to our vision and were executed with a flair untouched by any other artisan around. The professionalism and communication with Eric was never anything but stellar. In the end, our home has increased in value because of the detail and we are ecstatic with the results. Would I recommend him? Oh, yeah. “Eric and his team are true craftspeople and artists - - expert in technique, knowledgeable about options, hugely creative and only satisfied with perfection. In a world where customer care and attention to quality seem to be lost, Spiegel’s Decorative Finishing Studio is the uncommon standout. We have known, worked with and referred Eric to many friends over the last ten years. He worked extensively on two demanding high-end condominium projects for us. Eric is that rare artisan who understands your vision but also can create tasteful options that you never may have thought of. There is no “one size fits all.” His creativity is boundless, his taste superb. The mix of textures and styles that are available through Eric enable you to make special statements with your project – and usually at far better value and impact than with wall coverings/papers. LINDA AND TONY KATZNAPLES, FL. Eric Spiegel did a phenomenal job refinishing my tired dining room table, chairs and breakfront. I was amazed at how much personal time he took getting to know me and my needs. He brought me into his workshop at different stages in the project to make absolutely sure I would be happy. Needless to say, his work is exceptional. He came highly recommended from a designer friend of mine and I would highly recommend his company because he goes the extra mile and is very professional -hard to find today! I can't say enough about Eric Spiegel !!! He is so talented and truly passionate about his work. I have worked with him on several projects and I can say without reservation that he gave 100% each and every time. Eric is the one person who I trust completely! He has a heart of gold and will not stop till everything is "Perfect"! A rare find these days!! I'm so very proud and fortunate to have his amazing "art" in my home! If you want the best work and want to have someone who truly cares about your project Eric fits that to perfection! I have the privilege to work with many successful craftsmen across the US, Canada, and even a few from Down Under, but to work and know Dr. Faux is an honor as he is one of our Nation's most exclusive faux artist, hands down. Over the years, we have used Eric's services and have, without exception, been delighted with everything he has done. We at Hill's Lighting & Barstools also recommend him to any of our own customers who need his services. We make it clear that they can find no one better for the job. I have worked with Eric and his company for many years through out Bonita Springs and Naples . Eric is a gifted faux artist and the best wood grainer in maybe the world. Lol. But true. He also has the ability of pulling together a good team of employees. I highly recommend considering Eric for any paint project. You will be happy with the professionalism as well as the artistry.